On January 31, 2019 Engilena Kessler of Edmonton formerly of Medicine Hat, passed away peacefully at the age of 90. She is lovingly remembered by her daughters, Patti Chomyc and Donna (Larry) Gerow, 8 grandchildren, 10 great-grandchildren, her sister Mary as well as numerous nieces, nephews and friends. 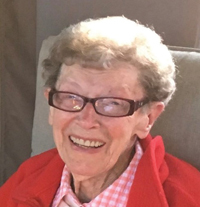 A celebration of Engilena’s life will be held on Tuesday, February 5, 2019 at 11:00 am at St. Agnes Catholic Parish, 10826 – 62 Avenue, Edmonton. Her final resting place will be with her husband Ruben at Hillside Cemetery in Medicine Hat at a later date. Sending Patti and family, Donna and family many hugs during this profound time of sadness. So sad that my favorite aunt has passed. I will always remember Aunt Enge and the wonderful memories she brought to my life. The only comfort I feel is that she is now with Uncle Ruben and my dad Ed. Patti, Donna and your families. I am so sorry to hear of her passing. I have such wonderful memories of a beautiful woman that lived next door. She treated me like one of her own. So many great wonderful memories to cherish. Both of your parents will always hold a special place in my heart.